cost-effective high data-rate service to home, business, and enterprise customers. either a wide area or a narrow strip of territory as long as line-of-sight paths are available. A system level diagram is shown below. The essence of Teletronics' point-to-multipoint network is its versatile Base Station Units and Client Station Units, both of which can act as a Bridge or as a Router (see Bridges/Routers for details). 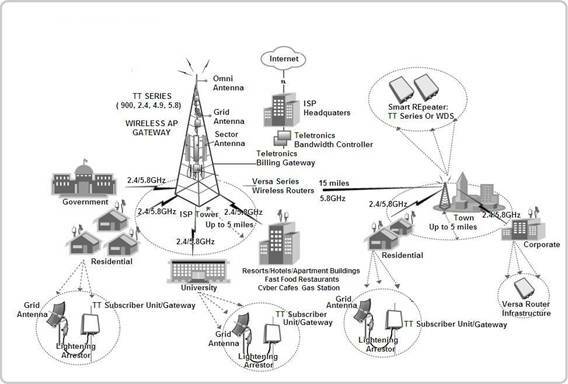 A general illustrative diagram is provided below: Any one of Teletronics radio equipment, whether TT, EZPlatfrom or EZMimo, can be used as Base station or Client Station (Commonly known as the CEP). The determining factor is the bandwidth requirement. 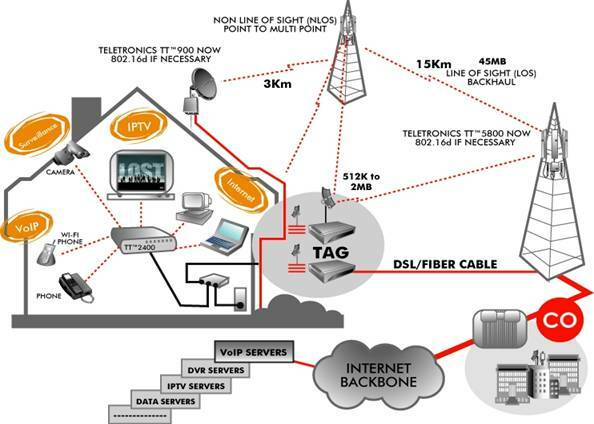 Teletronics Point-to-Multipoint system is trade registered as the EZloop system. As the trade name suggests, Teletronics' EZLoop® systems are easy to implement. The systems have been deployed in cities, oil-fields, mines, schools, banks, surveillance posts, along river-banks, and at other locations around the world. EZLoop® systems are ideal for small to medium-sized operators that cannot afford telco-level costs in implementing the specified elements of an optimized wireless network. Performing a customer needs assessment, fully matching system specifications to desired commercial performance. Performing the necessary propagation analysis and conducting a site survey. scalable to the customer’s long-term growth expectations. Installing, integrating, testing, calibrating, and optimizing the system. Providing training courses for operation and maintenance; and carrying out system maintenance and support services. Providing warranties; repairing or replacing defective warranted equipment; and offering dial-up network management and performance assistance.